Nine years since its introduction, there are now some seriously tempting deals on the Aston Martin V8 Vantage Roadster. How tempting? The earliest cars are yours for around £40k with just 40,000 miles on the clock, and some of these cars are still being sold through main dealers. Go for the desirable 2009 model-year facelift and you’re looking at the mid-£50k bracket, with mileages typically spanning just 10-20,000. But for most used Vantage price points, there’s a showroom-fresh Porsche ready and waiting, from the £39,553 entry-level Boxster through to the sensational – but slightly less practical – Boxster Spyder for £60,459. Today, we’re driving the GTS, the car that topped the Boxster range before the arrival of the 3.8 Spyder. It mounts a 3.4-litre flat-six behind the driver, sending 325bhp and 266lb ft to the rear wheels via a six-speed manual gearbox. 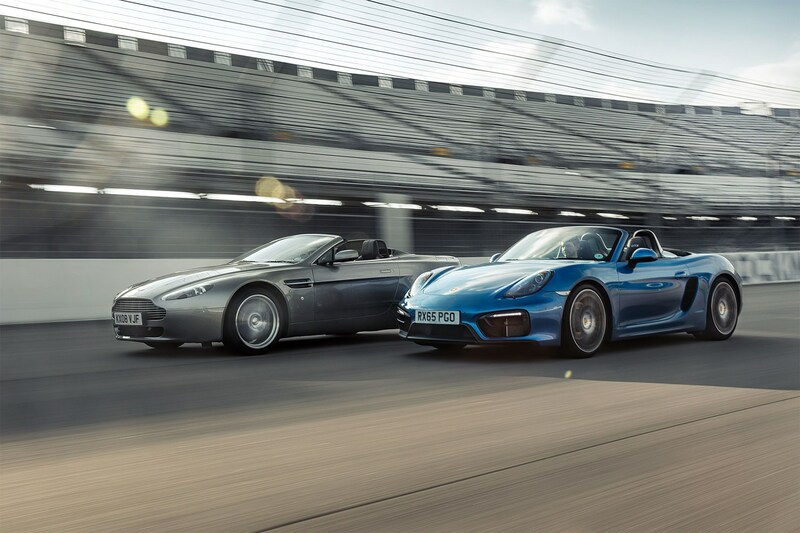 Costing £53,872, Porsche’s mid-engined roadster will set you back the same as a low-mileage 2009-2011 Aston. Which is exactly what we’re pitching it against, our test car supplied by Aston Martin Works (astonmartinworks.com). The Aston still feels like a £100k machine, with its beautifully stitched leather dash that arcs with a graceful curve, and low-slung, deeply comfortable seats. Push the jewel-like key into the centre console and the V8 erupts like a munitions factory thrown on a bonfire. This is an intoxicating but mellow rumble, not an unholy din, and dropping the roof allows you to enjoy it all the more. Press a button and the thickly insulated fabric roof neatly retracts behind a tonneau cover panel, and does so on the move. Even at relatively high speeds you’re well protected from buffeting, while refinement is still good with the roof closed. The V8 builds its power undramatically at first, but with the backwards-reeling rev counter clear of 4000rpm the exhaust note hardens and the V8 sparkles, though it never feels as fast as all that noise suggests. The Vantage doesn’t feel like a particularly sporting car, either: the steering is quite slow and heavy, the gearshift a bit JCB, and no amount of clever tailoring can hide the 300kg it’s packing over the svelte Boxster. You’re also keenly aware of a more wobbly structure than the Vantage coupe, the tremors sneaking up the steering column a constant reminder. The Boxster doesn’t feel quite as special inside, but the fit and finish are still superb, the infotainment bang up-to-date, and the driving position absolutely superb: low-down, snug, endlessly adjustable. Like the Aston, the Boxster’s fabric roof stows on the go at the press of a button, but there’s no tonneau cover here – the fabric top is still exposed, and the gaps between it and the bodywork look a bit clunky. Nothing clunky about the driving experience, though. The steering is tight, quick and precise, the chassis is both supple and far more playful than the previous generation Boxster, and the brakes have superb feel and endless stopping power. The powertrain is the icing on the cake. The six is a little torque-light down low, but that just encourages you to use all the revs; a fizzy, responsive, delectable 7000rpm-plus. And then you just do it all over again with a flick of that slick six-speed manual. Vantage is based on 10,000-mile/annual visits to your chosen workshop. The schedule changed for cars built from December 2012, but our budget focuses on earlier cars. Prices from Aston Martin Works are as follows: 10k/1yr £853; 20k/2yr £1069; 30k/3yr £983; 40k/4yr £1205; 50k/5yr £944; 60k/6yr £1254; 70k/7yr £1220; 80k/8yr £1205; 90k/9yr £983; 100k 10yr £1155. The Boxster requires a service every 20,000 miles or two years. Typical main-dealer charges are £480 for a minor service, £610 for a major service. Adrian Flux Insurance quotes £344.50 fully comp for a 40-year-old average male driving the Porsche, £400 for the Aston Martin. There are a number of desirable options for the Aston, including the Power Upgrade (£2750; boosts 4.3-litre cars by 20bhp/7lb ft), the Sports Pack (£5395; 68% stiffer front springs, lightweight five-spoke alloys, Bilstein aluminium dampers), Bluetooth audio and phone connectivity (£645 for post-2008 models), iPod integration (£1194), and a reversing camera (£3485). Carbonfibre exterior enhancements include a grille (£2255), mirror caps (£1493), rear lamp surrounds (£1194), side strakes (£1293), and splitter and diffuser (£3273). Clear rear lamps are £1292, painted brake calipers £1515-£1995. Aston Martin Works also offers bespoke upgrades on pre-owned cars, from the retro-fitting of the above to complete interior retrims and exterior colour changes. At £53,872, the GTS carries a £6k premium over the Boxster S, but if you option its extra equipment on an S you end up at a similar figure, and without the GTS’s power hike and some of its USPs. Adaptive dampers, the Sport Chrono Pack with dynamic engine mounts, 20-inch Carrera S wheels, Sports seats Plus, and dynamic bi-xenon headlights are all standard, but would add £4358 to a Boxster S. But you can spend more. Key options include front/rear parking sensors with reversing camera (£1044), PDK dual-clutch gearbox (£2351), metallic paint (£558), torque vectoring with locking rear diff (£890), carbon brakes (£4977), cruise control (£267), heated seats (£284), PCM with navigation (£2141) and DAB radio (£324). Fixed-rate sports suspension is a no-cost option. Aston gets plenty of stick for its ageing product line-up (that 2016 DB9 replacement can’t come soon enough), but the advantage is evolution that’s ironed out all the bugs. As a result, many of the early cars’ glitches have been sorted under warranty – ‘front cover oil seals, for instance,’ says Aston Martin Works’ Justin Pearce – and the knowledge fed into later cars. The V8 engine is also known for its strength and durability. Buy from Aston Martin Works or another main dealer and you’ll currently benefit from the Assured Scheme and its 140-point check with 12 months’ MoT and warranty, plus any servicing that’s due within three months or 3000 miles. A new Timeless scheme will be introduced during 2016. In our experience – and barring occasionally fiery GT3s – Porsches are robust, and more amenable to high mileages than more exotic cars – both in terms of how they shrug off those distances and how the used market accepts them afterwards. Then there’s the three-year warranty and breakdown cover. There’s much to admire about the Aston, notably a timeless design that still turns heads, that fantastic engine, the beautiful interior and a fabric roof that’s refined when in place, and neatly tucked away when not. But it’s not as fast or engaging to drive as the looks and noise would suggest, and scuttle shake is quite pronounced, a tell-tale that the body has lost some stiffness with the removal of the roof; it all makes for a slightly leaden driving experience. The Boxster GTS, meanwhile, is hard to fault. It looks and drives more like a supercar than a £50k drop-top, suffers none of the wobbliness that afflicts the Aston, and offers all the feel-good security of the latest numberplate. This month, the new car has to get the nod. I’ve had my GTS for 2500 miles now; it’s the closest thing to a supercar for £50k, and balances everyday usability with serious performance. I drive it all the time, in all weathers, and every journey is a joy. It looks great too – the 981 re-style is perfect to my eyes. The dealer paid for half my options and put £1500 towards the car to win my business – impressive. The previous owner pulled fuse 22, so there’s no muting my Vantage at any revs, and I average just 12mpg – I’m certain that 50% of the chemical energy in the fuel is converted into noise! The gearbox can be clunky at very low speeds but it’s forgivable at speed. It’s all about the engine – hood down, with the Vantage V8 at full chat, is one of life’s joys.